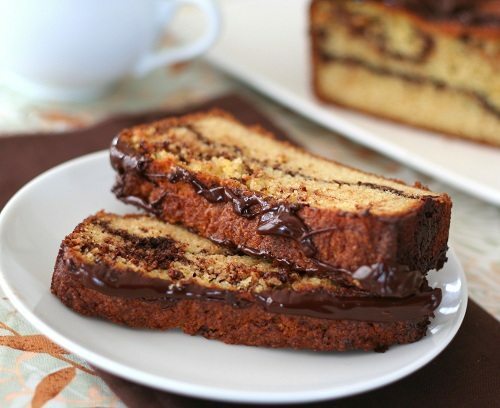 A sweet low carb quick bread swirled with orange and chocolate, and with a chocolate drizzle. This almond flour keto loaf cake makes perfect breakfast or tea-time treat. Consider the phrase “falling down on the job”. I don’t know about you, but when I hear it, I think of someone intoxicated at their workplace, quite literally falling down (drunk) on the job. That literal image may speak to my own proclivities, although I can state unequivocally that I have never fallen down drunk on the job. Have I actually been drunk on the job? Um, well. Ahem. Let’s just say that on occasion in my work in higher education we held some after-hours events where a few drinks were the norm and I was a wee bit wobbly-pops on the way home. And that’s all I am going to say about that. These days, however, I do feel a bit like I am falling down (not drunk) on the job. Most of the time, I think that being a food blogger is the best job in the world. I do what I love to do and I am fortunate to make a decent income from it. But there are times that I get very overwhelmed by it and by all the things I need to do or think I need to do. And by the fact that I have a tendency to say yes to too many projects. Right now is one of those times. I am trying to do it all, but I have the distinct sense that I am not doing any of it very well. I know I will get a handle on everything soon and in the meantime, the best approach is just to keep plugging away, one little bit at a time. Otherwise I would just want to climb into bed, pull the covers over my head, and not come out. Tempting, definitely, but not the best way to handle the overload! This is by way of apology to all of my bloggy friends and all of my readers if I am not putting in quite as much effort as I normally would. I want to have the time to make the rounds, commenting on all the amazing blogs I love, as well as responding to each and every comment on my own blog or responding to all the emails and questions I get from readers. Quite frankly, that’s how I’d prefer to spend my whole day, with maybe a little baking, photography and writing thrown in there too. I love my online communities, they make me feel remarkably connected to a far larger network of friends and support than I could ever build face to face. Given my druthers, I’d fritter away most of my time on these communities, connecting and learning and growing. But you know the drill. That’s just not how it goes. Despite the fact that the majority of my work is done online, much of it is in frantic haste, trying to finish one assignment while keeping tabs on the next, and still posting actively enough to keep people engaged. And then there are the offline obligations, trying to manage my kids’ lives and spend time with my family. It’s a constant war against the clock, and I don’t know anyone who doesn’t feel the same, no matter what they do. So. Not to feel all woe-is-me sorry for myself. Because I don’t. I know I can only get so much done in a day and something has to give. I do my best and I know that most of the world forgives me for not quite meeting its, or my own, expectations all the time. And when I do have a little tiny bit of time on my hands, I find myself in the kitchen, throwing some ingredients together to bring you a delicious treat. 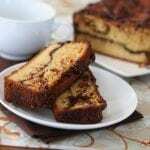 Like this low carb Chocolate Orange Swirl Bread. Orange isn’t necessarily my go-to flavour to combine with chocolate, but this recipe just works. 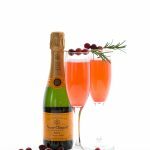 The orange gives it a bright, refreshing note, while the chocolate makes it feel like a decadent treat. Eat it…and forgive me for falling down on the job! 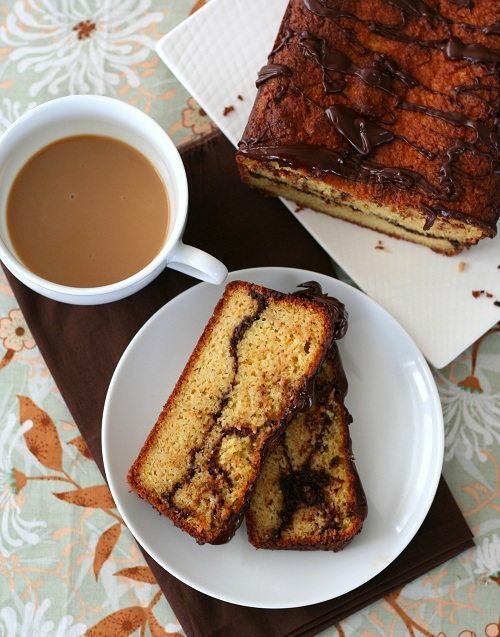 Low carb orange quick bread, swirled with chocolate. A delightful treat for breakfast or tea time. Preheat oven to 300F and grease a loaf pan well. In a small saucepan over low heat, melt chocolate, butter and powdered erythritol together until smooth. Stir in vanilla extract and set aside. In a medium bowl, whisk together almond flour, protein powder, baking powder, baking soda and salt. Set aside. In a large bowl, beat butter until smooth. Add granulated erythritol and beat until lighter and well-combined, about 2 minutes. Beat in eggs, one at time, scraping down beaters and sides of bowl with a rubber spatula as needed. Beat in orange zest and stevia extract. Beat in half of the almond flour mixture, then beat in orange juice and almond milk. Beat in remaining almond flour mixture until well combined. Spread half the batter into the prepared pan, and then dollop with about 2/3 of the chocolate glaze. Use a knife to swirl the chocolate into the batter. Top with remaining batter, and swirl a bit more, then smooth the top. Bake 55 to 60 minutes, or until top is deep golden brown and a tester inserted in the center comes out clean. Let cool in pan 5 minutes, then flip out onto a wire rack to cool completely. Drizzle with remaining chocolate glaze. Serves 16. Each serving has 6.6 g of carbs and 2.8 g of fiber. Total NET CARBS = 3.8 g.
Such an awesome flavor combo. Beautiful!! Don’t be hard on yourself, Carolyn. There are only so many hours in the day and some things just need to take priorities over others. In the meantime, you manage to put out a gorgeous looking bread! Looks like a winner Carolyn! Plan to try it soon — just made your Pumpkin-Coconut Bread for like the 100th time last week and made French Toast with it — YUM!! I can just see my husband’s look of bliss as he takes his first bite! He loves orange and chocolate. My I ask what brand of stevia extract you use? I think you do a stunning job and truly have made my low carb pre-diabetic life much easier and certainly more tasty! Thank you! I use NuNaturals, but I’ve also used Sweetleaf. I like them both. This looks fantastic! I love orange things. Don’t apologize, we all know how things can get hectic. Just do your best and we will all be hanging out waiting to see what you come up with next. This sounds fantastic. However, I don’t use whey protein. What would happen if I left it out? It wouldn’t rise very well. YOu need some sort of protein…how about hemp? Or egg protein powder? I’m wondering if I can mix up Crystal Light Orange to use in place of the orange juice? Imagine the flavor possibilities…I’m thinking Cherry Chocolate Swirl or Strawberry Chocolate Swirl. And even fewer carbs per serving. Possibly. I don’t know how strong the flavours are to come through, but it may work. It won’t save you all that much in carbs, as 1/4 cup OJ only has 6 g of carbs for the total recipe. Carolyn, it always DOES look like you put in 110% on this blog even if you don’t feel like that’s what’s being projected. It’s a tricky balance for everyone to balance work, personal life and hobbies. You seem to be doing a fine job at it though! Keep going, girl! 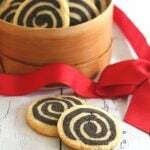 … And thanks for sharing this scrumptious swirl bread. I’ve got to try it sometime! I was wondering if you use fresh squeezed orange juice or if you use the orange juice that you find in the carton in the refrigerated section? I think we all go through that feeling (I know I am right now too) – your opening sentence caught my attention ;). We all do the best we can and just have to remember what our priorities are. I know you have other priorities and I can live with that. I don’ think anyone would fault you for not posting ‘enough.’ I think we’re actually pretty lucky to be on your mailing list and getting all kinds of decadent yet low carb recipes. A year ago I actually had no idea low carb and delicious could even exist! My guess is you must have 36 hours in your day to do as much as you do. And, we greatly appreciate your hard work. Think we’re harder on ourselves than others are, so treat yourself kindly. Oh, my. Does this bread look fabulous! Love your creations. 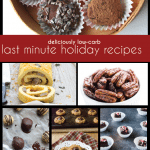 This looks just wonderful and as always I’m in awe of how you make these gorgeous treats low carb and gluten free. I always forget about the orange/chocolate pairing but it works so beautifully. Love the swirl in this! Ahh, it’s so nice to know that you’re human after all! 🙂 I work online too, and I usually take two days a year when I don’t turn on the computer all day. Completely overwhelming sometimes – but most times, worth it! Can’t wait to try this – the quality of recipes you put out is phenomenal. You have really made a difference in my life! Thank you! 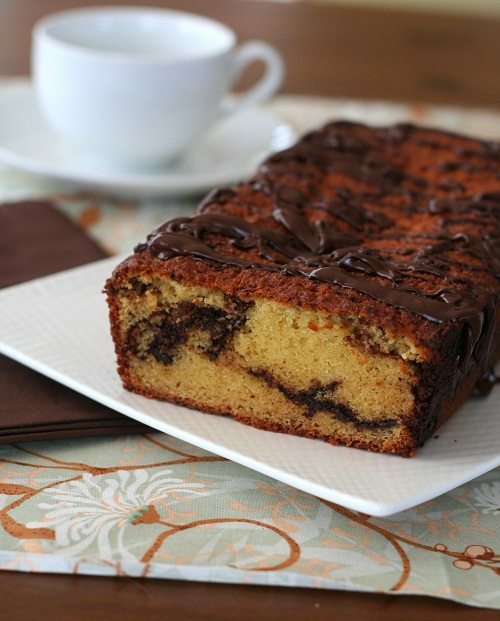 Wow, I can’t stop staring, this chocolate bread looks delightful! The chocolate drizzle too…. puts it over the top! Pinned! This bread is just absolutely gorgeous!! this looks nice…i have to laugh at your comments because i am now 62 and look back at years of always thinking i could do more…even tho my home and life are very nice…so i would say this is a result of being someone who is very interested and involved in life with many things being accomplished. when you are my age you will maybe feel that the best thing you did of all was care for your family and others… i do not see your site as “less” than anything. I am relatively new to your site, and I love it. I have already made a lot of recipes and they are always great. I always wonder, though, whether the recipes made with almond flour freeze well. 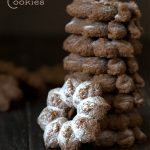 I often only have one afternoon to bake for the whole week, and I wanted to know would this, and other almonf flour recipes, would freeze well. Also, if they are going to be eaten within a few days, is it best to refrigerate them, keep them at room temperature, wrap them with plastic wrap? What would be best? Thanks for any suggestions. Again, your recipes are a life savor for me! You can freeze all the breads and muffins. I do. I make huge batches at a time and freeze them. 30 seconds in the microwave and they’re like freshly baked. When I don’t freeze them and will eat them within 3 days, I keep them on the counter, wrapped in tin foil. 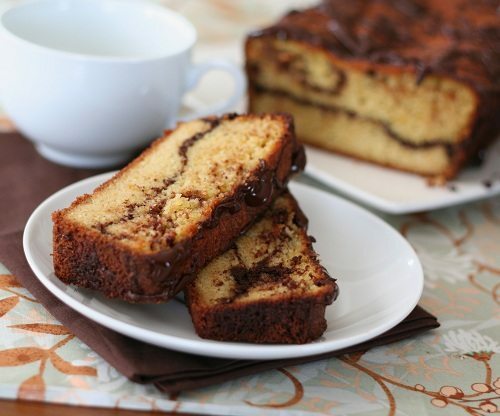 This Chocolate Orange Swirl Bread is fabulous! I’m sure it would have been great without the couple of modifications that I made, but want to share what I did. •	The drizzle solidified before using, so I had to re-melt it, and added some butter to give it a smoother consistency for drizzling. I also added some orange flavoring to the drizzle. I cannot thank you enough for all of your terrific recipes! They’re not only delicious, but they’re easy to make. Many thanks! I made this yesterday and it was amazing! It would seem that the brand of sweetener really might make a difference in recipes (as you speculated when I had an issue with a chocolate frosting recipe of yours). I used powdered Z-Sweet. My chocolate swirl and glaze was quite thick, even though I measured the ingredients very carefully. I added almond milk to thin. I also added some stevia to it as it wasn’t very sweet. I offer this info not as a criticism but to make others aware that different brands of sweeteners might result in the need for some tweaks! 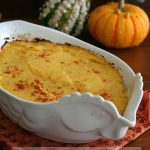 Again, this is a wonderful recipe, and I will make it again! I agree, Pam. It’s tricky, I want to create recipes that work with everyone’s choice of sweetener, but they do differ and you have to be prepared to make some modifications if yours is not the same as what I am using. There’s sometimes just so much we can do in the day. I just wish we had more hours. Food blogging can be so exhausting sometimes! This bread on the other hand – I really need it in my life! It’s the perfect pick-me-up in the mornings! Well this looks wonderful! I love orange and chocolate. Keeps you ‘up’ at your job for a while for sure. This looks fabulous! I hope to try it soon. What size loaf pan did you use? A regular 9×5 inch loaf pan. hii there i just discovered ur blog todayy and think its amazing! 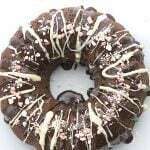 i love all ur ideas and recipes i especially am obsessed with chocolate orange. I’m 16 from bahrain and am trying to eat healthier. i just wanted to ask if the whey powder was important and if i can be substituted? because my parents wouldn’t allow me to get it. Hi Fatima – the whey powder helps it rise properly, but if you can’t get that, try using another egg. Of if you can find meringue powder (just powdered egg whites). I know, I hear that ovens can vary by as much as 50 degrees. I don’t own one, I really should! What kind of pan are you using? Ones with darker non-stick interiors will give you darker results. Lighter aluminum pans will give you lighter results. This recipe was absolutely gorgeous. My first carb-free attempt at baking and it came out just perfect. Thank you! Chocolate and orange is such a good combo, i just love it. This just sounds amazing though. am sitting here drooling at the screen. I want to make this but i got no chocolate right now. Thinking of melting nutella for a few seconds and using that as the drizzle. Cant beat the Nutella.. eh? Sure, I think it would be amazing! If this is what you call “falling down on the job”, then you must have superpowers!